Is a Photoshopped Picture Still Worth a Thousand Words? Last summer my wife and kids visited our families in the United States while I performed in a play at the Edinburgh Fringe Festival. My parents arranged a family photo with my siblings’ families and my wife and two sons, and although my exclusion couldn’t help but fuel long-standing suspicions my parents would pick my wife over me in a second, I felt relieved to avoid the hassle of combing my hair, putting on pants, and brushing the crumbs out of my beard to have my picture taken. Actually, I didn’t have a beard at the time of the picture, but I did have a beard by the time my mom told me to have someone take my picture so the photographer could Photoshop me in. I expected to grow sick of the beard immediately and would take the picture once I shaved, but it’s been three months and the beard remains. I finally took the picture and figured if the photographer can Photoshop me in, maybe he can Photoshop the beard out. Please give all my nieces and nephews braces, acne, and thick glasses. Is there a Photoshop setting that might remove the disapproving look in my mother’s eye? I wasn’t even present the day the picture was taken–how did Mom manage to project her disappointment in a manner only I could decipher while any other viewer would only see a smile and a twinkle in her eye? If my hair looks thinner than my brothers’ hair, can you either thicken my hair or thin theirs? Is it possible to make the sister-in-laws appear jealous of my wife’s successes? Maybe a cocked eye and judgmental tilt of the head in her direction? If you can manage this, please send to me before Christmas so I don’t have to get her a gift. Can you prepare one version of the picture in which my wife is replaced by Zooey Deschanel? Please don’t send this copy to anyone else except me. If you can’t manage this technology-wise, just send me a picture of Zooey Deschanel. “That pansy Paul sure grew up to be a strapping man.” Good one! It would probably be a 1980s Timothy Dalton, a time warp miracle Photoshop might just manage. I’m nearly 100% sure there’s a Photoshop setting that can make you look good t sports. It should just be a little icon of someone being able to catch a baseball, right? 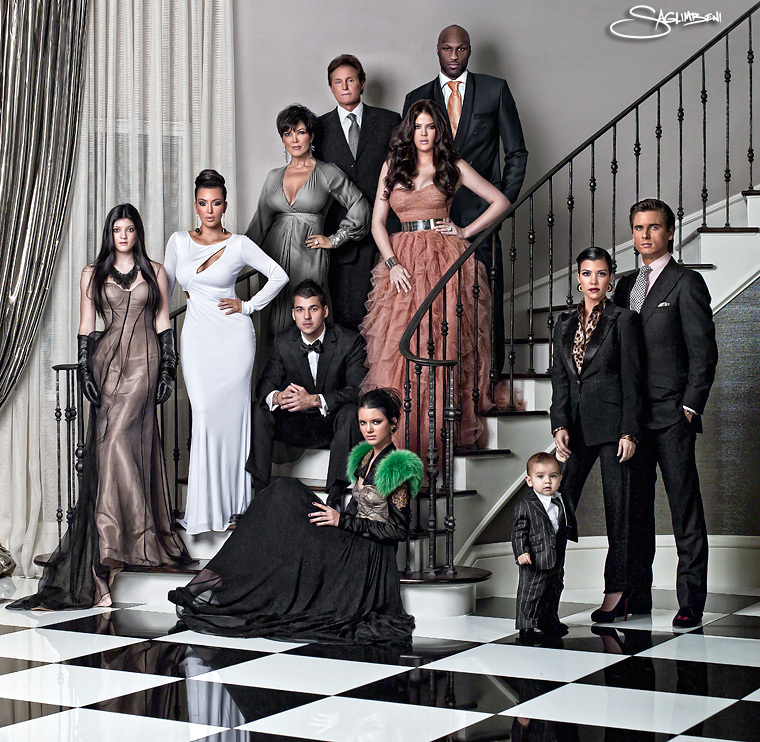 Why do those Kardashian photos make me think of the Adams family? They reminded me of the Dollenganger family from Flowers in the Attic. And for the record, my family has made no bones about the fact that if they could only save one of us from an oncoming train, it would be my husband. I’m glad my family likes who I married, but maybe they could pretend to be more excited to see me instead of my wife. That’s just what I thought, Lisa! Except pretentious and no-talent, instead of fun and campy. omg…I thought the EXACT same thing and was about to comment the EXACT same thing..well okay maybe not exactly with the same words, but yea….first thing I thought when I saw that picture was…they look like the Adams Family! Family gatherings might be more pleasant for many of us if we all just mailed photos of ourselves to a photographer, who would then photoshop us all together in a rich setting, looking happily pleased. We’d only look at the resulting picture and smile without any bad memories of how stressful that day together was. You should send a picture of Paul Rudd to be photoshopped in LOL! OMG–they do remind one of the Adams Family! Ah the annual Christmas picture….we have used Photoshop once or twice for “enhancements”. All eyes are on the camera…but Bruce looks a bit unsure about all this. Smart Bruce. After all his surgeries he can no longer control the direction of his eyes. I’m surprised how many readers actually seem to know the individual names of the Kardashian family members. I don’t know who these people are (apart from models) but they’re CREEPY. I like the idea of making your kids uglier. They don’t “need” to look good yet, so it’s not like you’re taking anything away from them…really. Later, when you’re genuinely an old fart and they’re good-looking young men, it still needs to be done but that’s okay cos you’ll be old and old people get away with being prats. I draw my family’s Christmas card every year so I have been “enhancing them” since the beginning! I drew it up yesterday and realized that as my husband and I get older we just keep looking better!! Since I’m ridiculously ignorant about using Photoshop, I’m pretty confident it can do all these things. Is there a way to photoshop my dignity back into all evey photo taken of me since ’05? Can you make my face as shiny and pointy as Bruce Jenner? I hope you sent a picture of yourself where the lighting is completely different from the original picture, so it’ll be obvious you were photoshopped in, because that’s always funny. Great gravy- little Mason does look like a tiny Gomez Addams?! Sorry you missed out on your family photo, Paul! We love Zooey at our house! Anyone who loves Zooey is alright with me. I need to convince my family it’s time for photoshop to intervene. I’ll die of shock if we’re ever able to take a decent family photo. Heaven forbid we take one picture at a time instead of 5 cameras going off simultaneously and nobody looking in the same direction. Adobe always seems to hide the Zooey Deschanel tool. I think she’s behind the clone stamp. Thanks for pointing out the picture was not your family; although, I spent 30 minutes trying to find you and Zooey. Next time, make the caption bigger. I just completed my family holiday photo. Me, Now Husband, Miracle the Cat. Not enough people, so I enlisted the mailman, the checkout guy from from the Safeway, and the scary hoarder lady from up the street. But we all wore fancy dresses, so it looks good. Yeah, that pretty much covers it. Especially the chick at the left that looks like Morticia . . . do you think they were going for an homage? Where is cousin It, I wonder? To make you look good at sports, maybe they could have you wearing an Olympic gold medal. Or if one isn’t enough, maybe you could be discreetly juggling three of them. In an amazing coincidence, Bruce Jenner happens to be selling his to pay for more surgery. Peg, you’ve certainly got it in for Bruce Jenner. 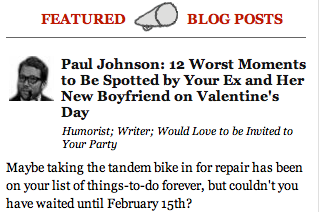 It’s the crushing disappointment, Paul. All those others are fame-seeking wannabes, near as I can tell, but Bruce Jenner was a sports legend back in the day. It is in your best interest to learn Photoshop. I never considered photoshopping John Cusack’s head over my husband’s. Thanks for that. In a group staff photo used for my office’s annual report, the graphic designer made the executive decision to photoshop my purse to appear much smaller. I suppose I looked a bit less like a golf caddy that way. Stuff the photo, I want to know more about you performance at the Edinburgh Fringe Festival! Slip of the finger . . . you know I want to know more about YOUR performance, (@EFF). You’ll probably want to photoshop me into the picture so go ahead. Answer to Post Subject: YES! Damned, no one would know about the lost sesion os of Frank Sinatra and Ben Folds but for my photos (er graphics). Sinatra/Folds long-last pic and music available on FB. Perhaps on my blog. Been a few years since the archeological dig for hip tunes.